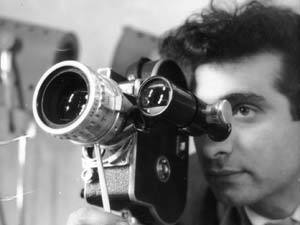 As Gino Moliterno explained during the cultural evening of 18 October, the Sicilian-born Mangiamele came to Australia in the early fifties and earned an income as a photographer but his real passion was the cinema. A small problem: he had no money or financial backers to make the films. Undeterred, he borrowed a camera and started to make short films documenting the difficult experiences of Italian migrants in those days eg two versions of The Spag. He filmed many of the scenes from his window with most of the settings being the Carlton streets near his home. In 1964 Giorgio Mangiamele made a 90-minute film – Clay – set at Montsalvat, an artists colony located at Eltham. Again, he basically made it with no money – in fact actors were asked to pay in order to be in the film! This lyrical film, which displays his love of the arts, was accepted at Cannes but had no commercial success in Australia. Gino told us that Mangiamele never managed to get funding from the new Australian Film Corporation and was ‘swept aside’ in Australia. In 1979 he went to PNG to make films for the government there. He died in 2001 aged 75. Gino stressed that Giorgio Mangiamele is the only Italian-Australian film director to have made films here, particularly at a time when the Australian film industry was practically non-existent. His work is inspired by De Sica and Fellini. Following the restoration of his films by the National Film and Sound Archive (NFSA) with Gino’s assistance, Mangiamele is finally recognised for his efforts and dedication to the cinema, with some of his films now regarded as first-rate. Five of his films are included in a double DVD that can be purchased from Ronin Films or through NFSA.